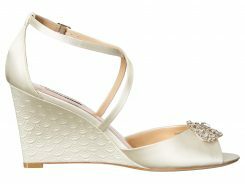 Dyeables Calista white satin is a 3 1/2″ open toe sandal with a block heel. This strappy sandal has two silver buckles, the ankle strap is adjustable. 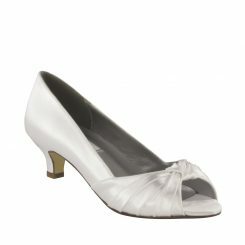 The Calisa is available in white dyeable satin and can be dyed to match any color. It is available in size 5-11 medium. 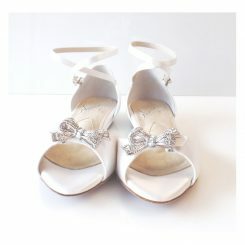 Dyeables Calista white satin is a 3 1/4″ high heel sandal. This very stylish shoe has double silver buckles perfect for any occasion. The ankle strap is adjustable to ensure the perfect fit. The thick heel is ideal for those outdoor events, no worries about sinking into the grass or walking across cobblestones. The Calista is dyeable and can be custom dyed to match any color. 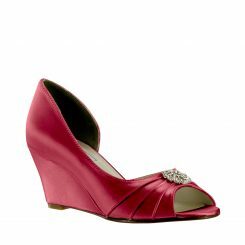 Perfect for brides, bridesmaids or prom, this is a shoe that can be worn all day and well into the night.